The Center for Genomic Medicine at the national hospital Rigshospitalet in Copenhagen, Denmark, performs genetic analyzes of samples taken from patients. The employees use sequencing machines to convert the samples to digital data, which they then analyze on Computerome. The supercomputer Computerome is run by the Danish NREN organization DeiC in collaboration with the Technical University of Denmark and the University of Copenhagen. Computerome is based in Risø, more than 30 kilometers from the hospital. A complete human genome sequencing takes up 120 gigabytes. It would not be possible to send such large amounts of data to Computerome over our regular internet connection, which was already overloaded with data from our smaller sequencing machines,” said bioinformatics leader Rasmus Lykke Marvig from Rigshospitalet. Some data sets were so large that they had to be moved manually: The employees copied data onto a hard drive and took it to Risø by car. Therefore, the hospital contacted the network department at DeiC. They wanted to know if they could connect the new equipment to Computerome via forskningsnettet, the Danish NREN. In 2017, DeiC was in the process of installing new optical communication devices in the research network. They allowed for higher bandwidth – up to 100 gigabits pr. second on a single fiber. “The new machine could have done with a 10 gigabit connection. But we already had several smaller machines, and we expect to procure more equipment in the coming years, so we decided to get 100 gigabit,” said bioinformaticist Frederik Otzen Bagger, Rigshospitalet. They had very little time to get a quick connection to Risø. Accordingly, they were happy to hear that DeiC was able to establish the connection quickly. “We experienced great enthusiasm and helpfulness. The connection became operational in November at the same time as we received the new equipment,” said Frederik Otzen Bagger. The connection from Rigshospitalet to Risø is a direct link established within the optical infrastructure of forskningsnettet. Data never crosses the Internet, which increases security. That is particularly important as some of the data is personally identifiable information. In addition to bandwidth it was also necessary to get a connection with low latency. The gene sequencing machine writes data directly to the disk drive. The system is configured so that the machine cannot tell if the disk is placed right next to it or many kilometers away in Risø. Currently, there is only one physical connection. If the cable were cut, users will have to fall back to the internet connection. “We are considering expanding with more parallel connections in order to achieve redundancy. But for the time being we have not experienced any crashes,” said Rasmus Lykke Marvig. Center for Genomic Medicine performs genetic analyzes of three types of diseases: Inborn diseases and cancer diseases, where you analyze the patient’s own DNA, and infectious diseases, where you analyze the DNA in the microorganisms that infect the patients. “It is important to diagnose certain inborn diseases right after birth. Now we can start analyzing data as soon as they come out of the sequencing machine,” said Rasmus Lykke Marvig. The center has been using Computerome since 2016. Most users of the supercomputer are researchers, whereas the center uses it for the treatment of patients. “We do not need access to the supercomputer all the time, but when we do need it, we need it right away. Therefore, it is an advantage that the tasks for Computerome may be prioritized. We’ll get access while research projects are put on hold,” said Rasmus Lykke Marvig. Another advantage is that researchers often try out new software programs and techniques. Once new software is installed, employees at the Center for Genomic Medicine can further test it and possibly take it into service. 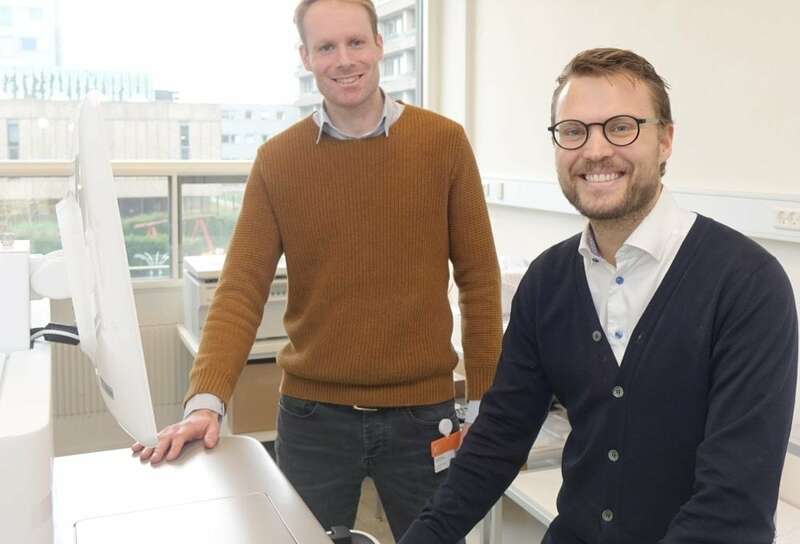 The picture shows Rasmus Lykke Marvig (left) and Frederik Otzen Bagger in front of the new genome sequencing equipment at Rigshospitalet in Copenhagen, Denmark.